Please join us on Thursday, August 23 from 4 to 6pm at Travis Elementary! Teacher classrooms will be open between 4 and 5pm, so drop in to the classroom to say hi. Feel free to drop off your school supplies while you’re there. Teacher assignments will be mailed out a few days beforehand so you’ll know right where to go. 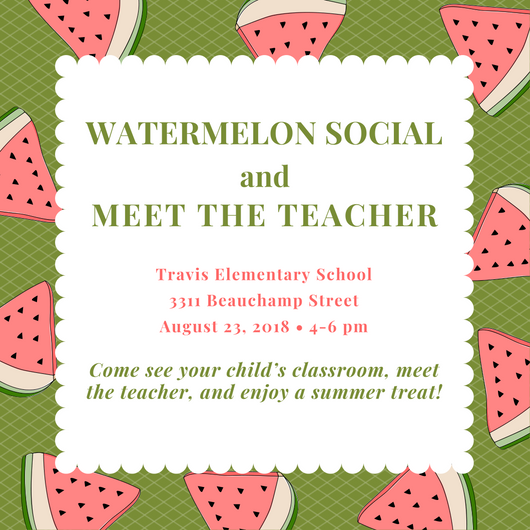 That afternoon anytime between 4 and 6pm, stop by the Multipurpose Room to grab some watermelon, greet friends new and old, learn more about the Travis PTA, and get a head start on shopping for all your Travis gear at the Spirit Store. We have some limited edition swag on offer, with something special debuting especially for our youngest Tigers! Contact the PTA Hospitality Chair with questions. We can’t wait to welcome you back from summer!